The Payentry Next Gen product has been designed and programmed over the last several months based on feedback from existing Payentry users. We’ve compiled their requests for system improvements and built in workflow enhancements that will make the user’s experience much better while maintaining the same logical rules and security settings embedded in our existing structure. The company dashboard will be a useful interface where users can quickly navigate to frequently accessed areas of the system. This component will convey critical information to individuals who access company information. 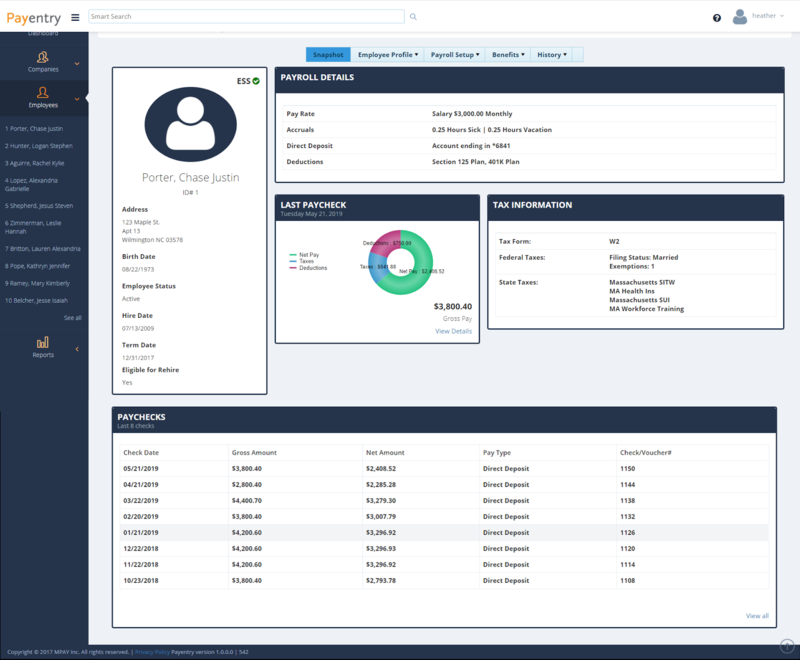 Users will be able to drill down and see specific information that is of interest to them throughout the company dashboard screen. The items selected to appear on this screen are some of the most frequently accessed information. When a visitor clicks on the first box, they will be able to see the details of the synchronization with their service bureau. This information helps the user determine if their account information is up to date or not based on expected transactions by the company or their service bureau. Clicking on the New Reports box will take a user to the Reporting page that displays saved and recent reports. This area includes any saved report writer reports, any reports with customized preferences that have been saved to My Reports, and any reports that have been ran in the past 24 hours. 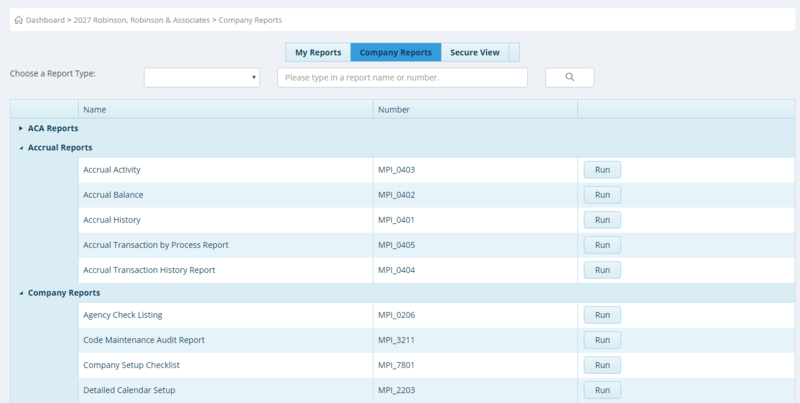 Users can also navigate to all company reports as well as SecureView from this page. The third box shows the user the last check date. 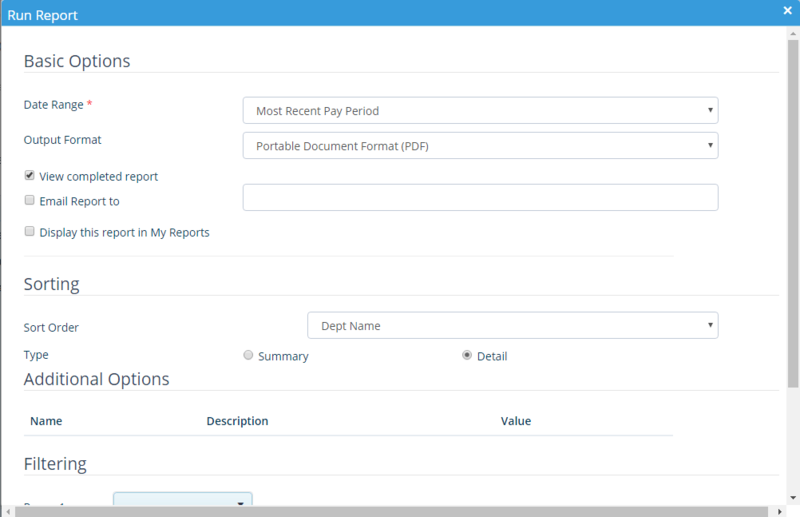 If the user clicks on this box, they will be taken to that payroll’s payroll summary report which details the total funds transfer for that payroll. The fourth box indicates the number of active employees and when the user selects this option, they are taken to their listing of active employees to conduct employee maintenance. This is typically done prior to processing the company’s next payroll. From here, a user is able to begin their payroll processing. When they choose to start their payroll, they will be directed to the payroll processing screen for entry or verification of payroll information. This component will illustrate to every user where the company is in the payroll process as indicated by the green and red color identifiers. The user will also see when their next payroll is scheduled to process. Other critical services are made available on this screen for users. A direct link to Time Management, HR Answers, Benefits and Hire and Onboarding make using these additional services easy. 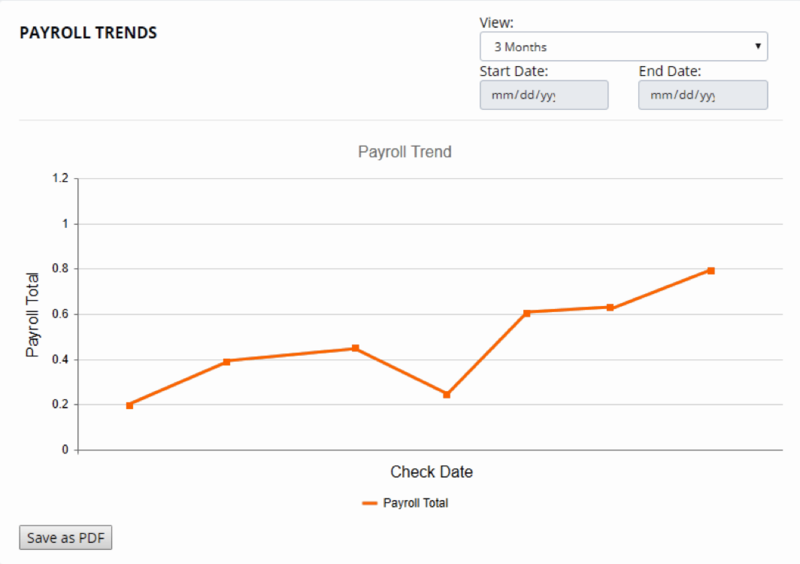 Company users can view a dynamic graph that illustrates their total payroll cost over time. Users are able to edit the time period they wish to view and can also save the chart as a pdf. This will help managers and executives notice trends and take action when necessary. 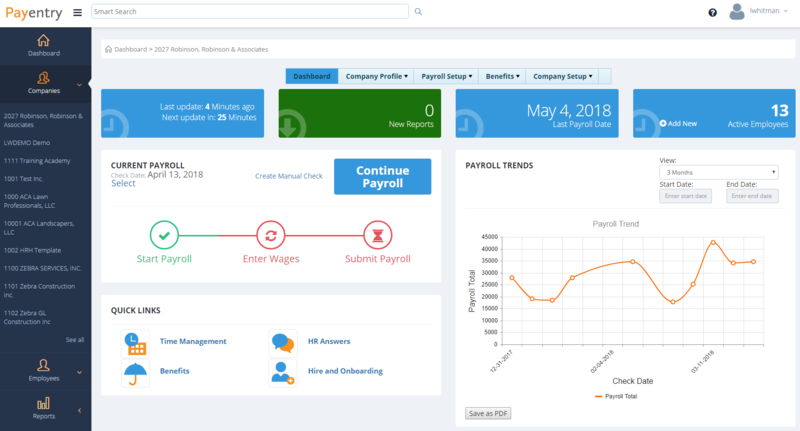 When a user clicks on a particular payroll check date, they will be directed to the payroll summary report which details the total payroll cost for that period. Displays ESS with a green check mark if the employee has enrolled in My Payentry. Nothing is displayed if the employee is not actively enrolled. Name of the employee in Last Name, First Name Middle Initial format. Employee’s title as specified in Department/Position format. Employee ID number as specified in Department/Position. Specifies whether the employee is active, terminated, or another status. Employee’s date of hire or rehire. Displays “Rehire Date” and the rehire date value if rehire date exists and is later than hire date. Date of separation. Displays “N/A” if no term date present. Specifies whether an employee is eligible for rehire by indicating Yes or No based on the check box in the Department/Position section. Displays the employee’s salary or rate. Displays the employee’s current accruals – such as vacation or sick hours. Displays the name of the bank and the last four digits of the employee’s direct deposit account number(s). Lists all deductions associated with the employee. Displays the employee’s federal tax form. 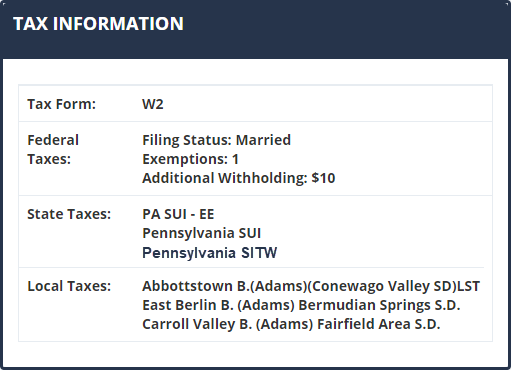 Displays the employee’s federal filing status (Married, Single, etc.). Displays a count of the employee’s federal tax exemptions. Displays the employee’s additional federal withholding if input. Field is hidden if $0. Displays a list of State and SUI taxes for the employee. Displays “None” if no state taxes. Displays local tax descriptions. Section is hidden if there are no local taxes. Displays the employee’s take home pay. Displays the employee deduction Amount. Indicates whether the employee was paid by check, Direct Deposit, or both. Displays the check number if paid by check, or the voucher number if paid by direct deposit. 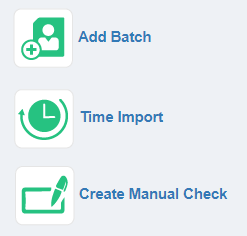 Add a new and separate batch to the current payroll. Batches can be used to pay specific departments, employee types or payroll groups. Choose your time file, import, and view details. Import any time and attendance file to record employee hours in your payroll. Calculate a paycheck and add a manual check to the current check date. 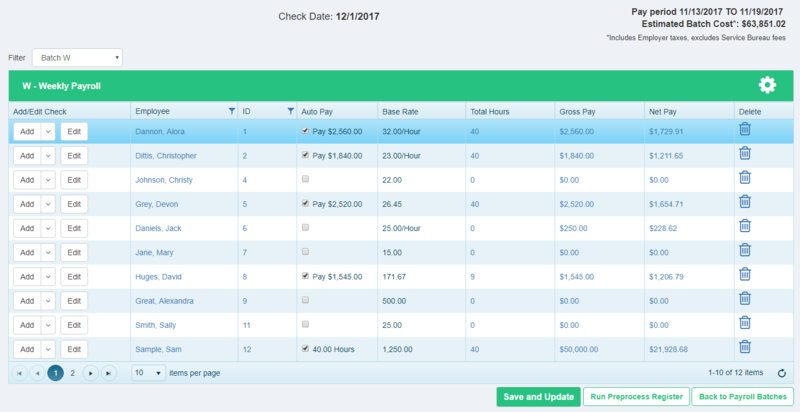 Choose the employee, select options, add earning code, hours or amount and view the check to see the net amount. 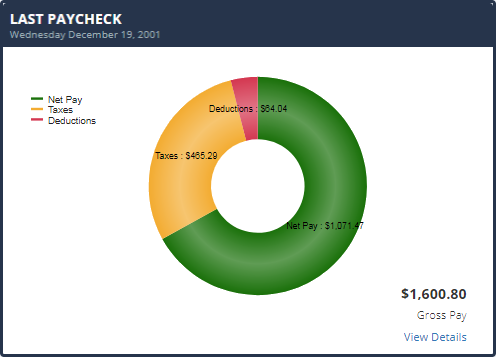 If the user only knows what the net amount of the check should be, this feature can be used to determine the gross pay of the paycheck. When you have entered all wages and reviewed preprocess registers for all batches, click this button to close your payroll. Displays the check date wages are being entered for. Ensure this is set to correct date before beginning payroll entry. This amount includes the employee net check amounts, employee taxes and employer taxes. This does not include any billing fees. This section allows the user to compare expected totals versus actual totals and helps administrators investigate any discrepancies prior to submitting their payroll. The system will highlight areas that have a variance for an easy comparison. When entering wages, users have the ability to show as much or as little information as needed to successfully pay employees. The gear icon is where the different display selections are made. 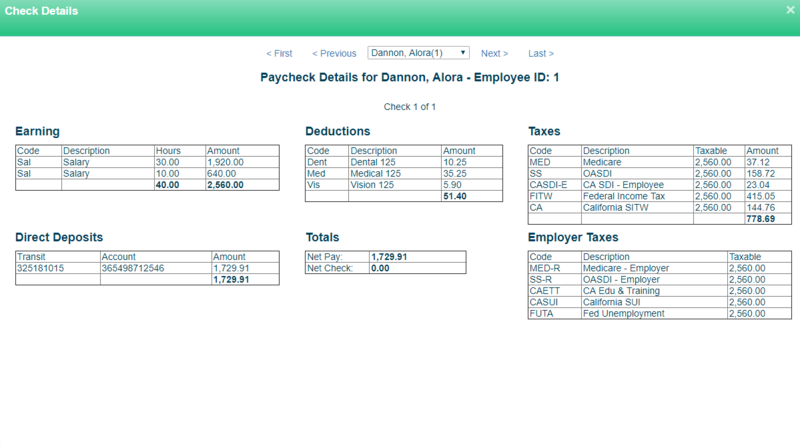 Users can choose to add a new check or edit the existing pay check while entering payroll wages. When a user elects to edit a pay check, they have the ability to customize the pay check for one time only or for the individual on a go forward basis. Users have the ability to block deductions, add/remove earnings, update tax rates, add a check memo and delay posting information to the employee’s self service account to name a few. The Gross Pay and Net Pay fields display the employees’ pay prior to any adjustments and after taxes and deductions. Clicking on either of these fields will take the user to the employee’s calculated pay check. The new reports section allows you to gather the information you need quickly and easily. The Saved Reports box will have your report writer reports that you have saved as well as any company reports you choose to save to the My Reports area. This feature allows you to customize the properties of the reports you need and save them for quick and easy access. The Recent Reports box will display any reports that you have ran in the last 24 hours. Simply click the arrow icon to download a PDF file of the report. The Company Reports screen displays all of the reports by category. You can choose the categories or search for a specific report by typing the name in the search bar for convenience. A dialog box appears when you select the Run button. Select the appropriate date range for the report, the output format, as well as a number of additional options. By selecting the box Display the report in My Reports, the report will be saved with the properties selected. 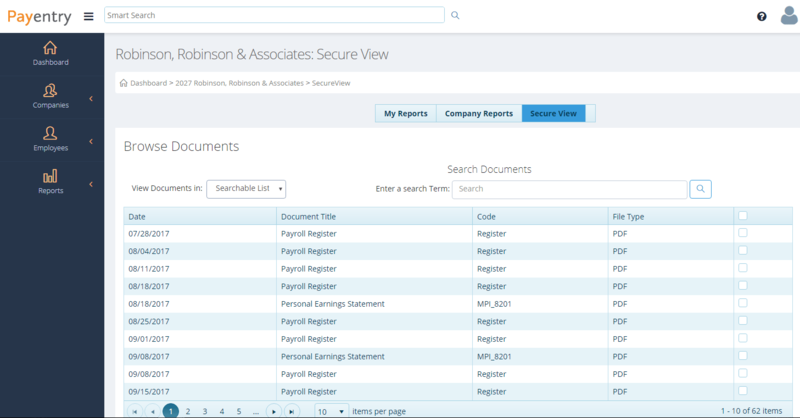 The new SecureView screen allows you to view your payroll and quarter/year end reports as a tree list or a searchable list. You can choose to organize the tree view by month, quarter, year, or report. You can choose to download all reports in the folder by selecting the checkbox next to the folder, or you can use the check boxes next to individual reports within the folder to download. The searchable list view allows you to search by report title or code to easily find the report needed. 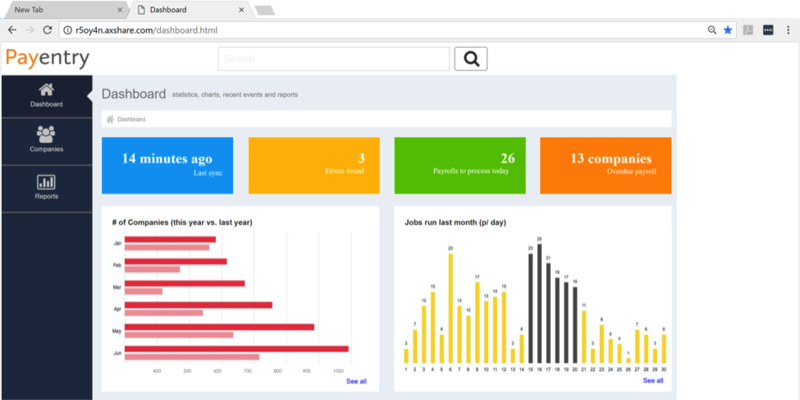 This dashboard allows service bureau employees the ability to see information across all companies they service. Users can quickly access frequently viewed data that will help them do their jobs. Displays the time since the last sync between Payentry and Millennium. This will help the user determine how up to date the information is in Payentry. 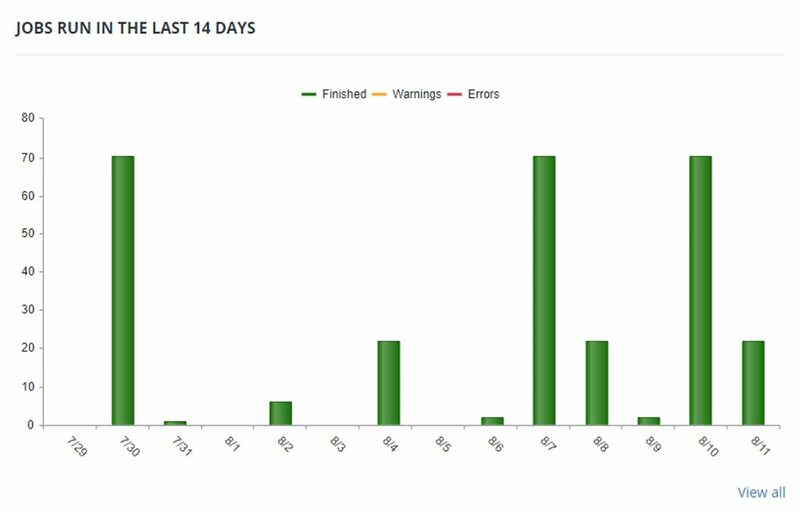 Displays a count of Job errors and job warnings in the last 24 hours. Displays a count of payrolls that are scheduled to process this week. Displays a count of overdue payrolls that may need immediate action. This links to the service bureau job queue where users can take action on particular jobs related to payroll processing and other related jobs. This links to the Add/Delete company functionality. Links to the security setup for the Payentry system for service bureau users. Links to the sync functionality. Allows users to initiate a sync, specify host information, and choose companies to download or remove from sync. Links to functionality that lets users specify Service Bureaus, and provides Aggregated ALE groups used for ACA filing. Provides access to Service Bureau resources to configure optional services. Displays a stacked column graph showing the total number of completed, warning and errored jobs. This lets service bureaus identify trends in job processing problems over time.